Since retiring as an Account Executive at Clinque in 2014, I have dedicated my time to my grandchildren. My first granddaughter, Kaitlyn, is an active participant in GiGi's Playhouse. She has grown immensely since our Phoenix opening and looks forward to GiGi University as her next step toward working in our community. It is a privilege to lead our board, to strengthen our programs for our families, and to continue to grow as we open GiGi U.
GiGi’s Playhouse has given me a platform to make the world a better place for my 20-year-old daughter Kaitlyn, who has Down syndrome. When she was born, there were little to no resources for parents to help navigate this diagnosis. GiGi’s offers a holistic approach to families; not just helping the person with Down syndrome, but their parents, siblings, extended family and so forth. GiGi’s Playhouse is making real-time impact on peoples lives right in our own community and I am excited to be on the front lines of a movement for acceptance, kindness and generosity. I am a very proud mom of a daughter with Down syndrome and we have participated at Gigi's Playhouse Phoenix since opening day in 2014. I have worked as an office manager and paralegal for a well known Phoenix law firm for the last 17 years. 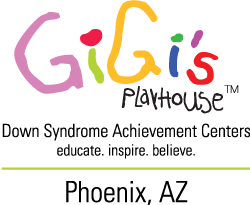 After visiting my hometown of Chicago and going to the Hoffman Estates Gigi's Playhouse and seeing the full potential of Gigi's Playhouse and what it means for our community I couldn't wait to be more involved within the organization. My husband and I love spending time with our daughter at Gigi's Playhouse and cherish all of the friendships we have made as parents as well. My passion for teaching has spanned over 38 years, encompassing every grade between preschool through college, with emphasis in special education and gifted education. A friend invited me to accompany her to one of the programs for her son at GiGi’s Playhouse. Within minutes, I knew I wanted to volunteer and become a part of GiGi’s family. I enjoy working with the kids and parents in the many of the programs as well as the Literacy and Math Program. Laura Currier has a BS in Speech Pathology/Audiology from Bradley University and a Master’s Degree in Speech Pathology with a Minor in Special Education from Arizona State University. She has worked as a Speech Pathologist in public schools for 16 years. As a fitness enthusiast, Laura coached Special Olympics for many years. She has and continues to serve as a Volunteer in several different organizations. She has served as the PTO Board President for Kiva and Mohave Schools. She was a Board Member and Board President for Xavier Girls Preparatory School for 8 years and has served on the Desert Foundation Auxiliary Board for 4 years. Laura is married and has 3 children all in their 20’s. Her Family has lived in Arizona for 36 years. Laura has been the Program Leader for our GiGi’s Language, Music ‘ N Our Peeps (LMNOP) Program for three years and has watched this program progressively grow as a result of her dedication and enthusiasm. I moved to Arizona from Chicago and I am happy I found GiGi’s Phoenix. I love all the fun programs where I can hang out with my friends. I am very excited for GiGi U, where once I complete the program, I can work at the GiGi Cafe....come in for a cup of coffee and say hi! I am very proud to be on the board of directors and help the Playhouse and GiGi U keep moving forward. Every day I try to give my Best of All! Sheri Kelly has been involved with GiGi's Phoenix from the planning stages and continues today as one of the Site Coordinators lending support to the operations of the Playhouse. Her background is in accounting and spent over 14 years as Manager of Operations of a federal government TRIO Educational Program in San Francisco. As a member of the initial Startup Committee for GiGi’s Playhouse Phoenix, Cathy Judge took on the part-time role of Site Coordinator. Cathy has extensive operations management experience, which proved valuable to setup operations. Cathy is passionate about the success of the Playhouse. Her granddaughter, Kaitlyn Gage, participates in several programs. Cathy’s Daughter, Jennifer Gage, was an initial Founder and served as President. Cathy is grateful to serve many families in the Phoenix Area. I am a wife and mother of four wonderful kids. They range in age from fifteen to twenty-five. My twenty-year-old son is a Type 1 diabetic. He was diagnosed at the age of three. It is a disease that never takes a day off and requires me to be his advocate in a world that often doesn’t understand the severity of his disease. I believe this helps me feel a connection to the families at GiGi’s because every family I meet has had their own triumphs and struggles as they advocate for their child. I have worked for the Scottsdale Unified School District as a substitute teacher and paraeducator since 2008. When I first began teaching, I was placed frequently in a special needs classroom that I loved. I found myself missing the students when I wasn’t there. It was my first indication that teaching special needs students is something I am good at and enjoy. I am now the Director of Adult Learning for the first ever GiGi Prep class and the GIGI U Program for the Phoenix area location. The participants and families are such a pleasure to work with and I am looking forward to meeting more families and hearing their stories. They are very inspiring, and I am thankful to be a part of something so special.